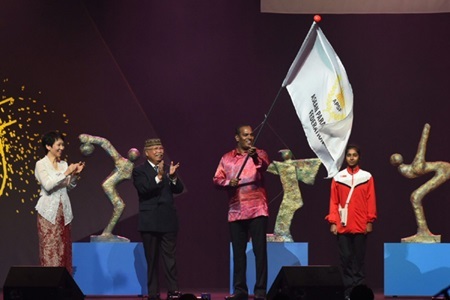 The curtain closed on the eighth ASEAN Para Games (APG) with a spectacular ceremony at the Marina Bay Sands and the official handover to the next host country, Malaysia. Malaysian Deputy Youth and Sports Minister M Saravanan takes the APG flag as Malaysia will host the next Games in 2017. "Tonight's closing ceremony marks the end of another great and inspiring Games," President of ASEAN Para Sports Federation Dato Zainal Abu Zarin was quoted as saying on the Games' official website aseanparagames2015.com. Viet Nam maintained the fourth-place position with 48 golds, as many as they grabbed during the last Games in Myanmar one year ago. "But my colleagues and I in APSF have concluded that, the eighth ASEAN Para Games here, will be remembered as the "best games ever" in the 15-year history of our Games." Zarin said this APG was a particularly moving one that had inspired him greatly. "In the last 7 days, we have all witnessed and experienced many great and inspiring moments. Moments filled with excitement, thrills, joy as well as despair and dejection," he said. "It has been an incredible journey, an experience that we all will cherish forever." About 3,500 participating athletes and guests were treated to a night of dance and musical performances. Singapore Prime Minister Lee Hsien Loong was the guest of honour at the event, where he declared the Games officially closed. Minister of Culture, Community and Youth Grace Fu handed the Games flag over to Malaysian Deputy Youth and Sports Minister M Saravanan. Fu said this past week has shown everyone that the APG was not just about celebrating medals and victories, but instead about celebrating unquantifiable mental strength while breaking barriers. "You have shown us that the APG is not only about winning and sporting excellence. It is about resilience and the indomitable human spirit," she told aseanparagames2015.com. After seven days of competitions, Thailand topped the medal tally with 95 gold medals. Indonesia, which won in the previous Games, came second with 81 golds, followed by Malaysia with 52 titles. Vo Van Tung was the last Vietnamese athlete to enjoy a victory ceremony yesterday after he triumphed in the men's shot put F33/34 event. Davis Machange of Malaysia came second, followed by Alihan Muda of Brunei. Vietnamese athletes also won 58 silver and 50 bronze medals in nine sports in this year's APG. According to Vu The Phiet, head of the Viet Nam Delegation, Vietnamese athletes had a successful tournament, especially the swimmers, who maintained the best in the region with 19 golds, and the power lifters, who stepped onto the top podium six times, although they were not at their peak performance. Phiet said Viet Nam set 16 new Games records and two Asian records. The General Secretary of the national Paralympics Committee said it clearly showed the development of para-sports in Viet Nam, fanning hopes to gain more berths to compete at the coming Paralympics next summer in Brazil. Phiet said potential athletes will be strongly supported for better achievement in the future. The ninth APG will be organised in Malaysia, which drummed up the night yesterday with an electrifying drum performance full of life and vigour. It will be the third time Malaysia hosts the Games, following events in 2009 and 2001.